The modern sideboard first originated in the form of the 17th century’s serving tables, which were situated in the dining room and were used to carve a joint of meat from, as well as to store utensils and plates. This made it a functional piece of furniture rather than a sophisticated one. The idea of a particular type of table based in the dining room and used to store serving utensils, cutlery, crockery and alcohol is thought to have been first popularised, among other candidates, by Thomas Chippendale. 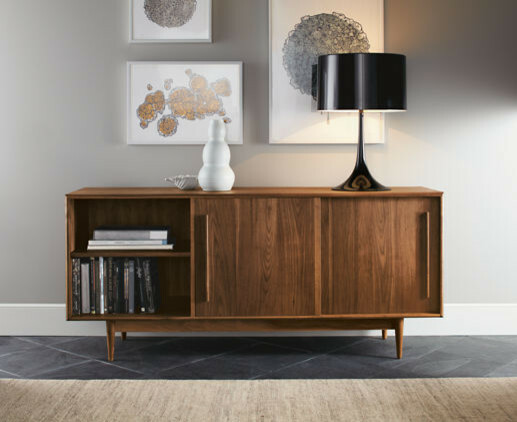 Sideboards are designed to be placed against a wall so that they can be easily accessed and conveniently used, and have tended to be wide to make for maximum storage space. The traditional place for a sideboard is the dining room. However, today, it is not unusual to find one in any room of the house, given the relaxing of previous traditions down the years. They serve the best practical purpose in a hallway, living room, kitchen or dining room. Down the ages sideboards have become known as a place to store glassware, cutlery, wine, spirits and crockery. This was so that guests and residents could be entertained in close vicinity to the dining area. Today, however, there is no exact purpose for a sideboard, which generally fulfils whatever function is required of it. The following are several possible uses for a modern sideboard. Display: The wideness of a sideboard allows for plenty of space on top to exhibit photographs, ornaments or other personal items. 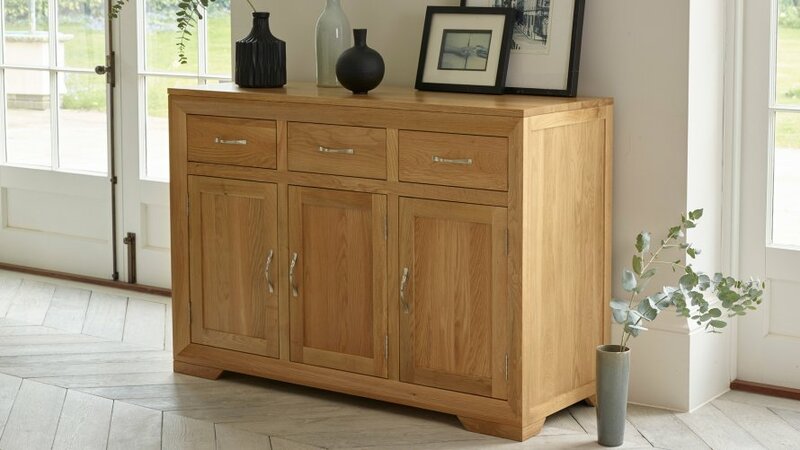 Storage: As mentioned earlier, sideboards often have plenty of storage space, which could be used for storing precious items such as family photographs so that they are not exposed to the heat and light. It could also store equipment for hobbies such as arts and crafts. What exactly is stored would naturally differ with the room, as in a kitchen it is likely to be home to cookbooks, among other items. Accent piece: Sideboards are attractive pieces of furniture with a good quality wood that is visually unique. It can therefore be used purely as a good design feature and to keep the layout of a room balanced. The features of a sideboard include several drawers: they could have as few as 2 or as many as 7. They also have 2 or 3 doors, while some incorporate open shelving as well. You should first make sure that you are choosing a sideboard with a wood or finish, such as pine, oak or a painted finish, to match the rest of your home’s furniture. It is not likely, for example, to suit your home to choose a more modern looking sideboard if all of your furniture is very traditional. Some sideboards use reclaimed woods: this makes for an authentically distressed look that can add a more antique touch to your room’s appearance. You will also need to factor in such practical considerations as what exact items your sideboard is likely to store. You may need a greater number of different drawers, or you may simply want s modest number of larger shelves or even a cupboard space, for storing larger items. To avoid the joints and veneers of your sideboard shrinking and loosening due to the heat, we recommend that you do not position your sideboard in strong sunlight or in front of, or near, a radiator. Good beeswax can be used for the cleaning and protection of your sideboard, allowing you to keep your furniture in the best possible condition.